Katie is in her final year, studying Multimedia in DCU and feels that she can give a lot to the Students’ Union. She chats about her original ideas, and feels she can out a fresh spin on Mental Health campaigns by introducing initiatives such as Laughter Therapy and Colour Therapy. “Laughter therapy is basically when one person starts laughing randomly and eventually, everyone else joins in. I’d hope that lecturers could do it in a lecture … it’s proven to relieve stress levels by 50 to 70 per cent” she explains. Colour therapy is using colouring to relieve stress amongst students. McGoey says she could do this by leaving colours and paper around various points on campus for students to colour in. “It just takes your mind off everything for a while” she says. “These are all very simple and very cheap ways of taking care of mental health” McGoey says, “and they’re proven to be very effective also”. 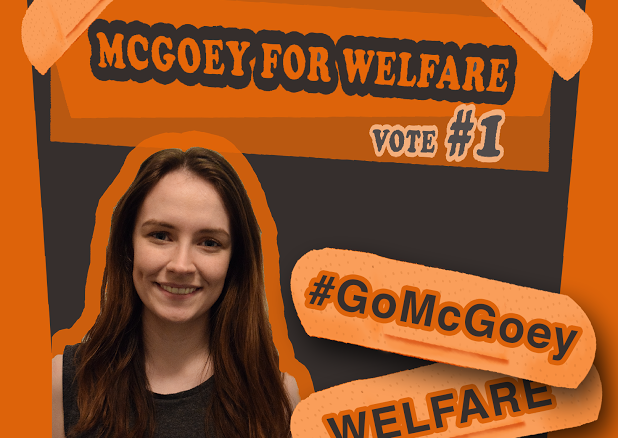 If elected, McGoey promised to focus on all aspects and variations of mental health. “Most campaigns tend to focus on depression – and that is important”, she starts. “But there’s also schizophrenia, bipolar, OCD, anxiety, post-traumatic stress … all different aspects of mental health which haven’t really been discussed in DCU”. Aside from mental health, McGoey wants to help students in their struggle to find accommodation around DCU. She has looked into effective methods in other colleges and hopes to implement these on campus. “NUI Maynooth use mystudentpad.ie, which is like a portal for accommodation” she explains. “You can use it to find digs, find houses or find room shares”. In terms of physical health, she would like to organize a colour run which would see various societies take part. “We did it as part of the Cancer Society’s ‘Relay for Life’ and it was so much fun, everyone enjoyed it”. She also promises to provide regular self-defence workshops for men and women if she gets the role. “Just to make students feel more safe and more capable when you’re out and about in Dublin … the workshops would be basic but really helpful for people who ever found themselves in that situation”. She would really like to see regular, weekly emails coming from the SU’s Welfare Officer about various tips and highlighting events that week on campus. “I’d highlight the services that the SU, the counseling service and the Interfaith Centre do to students in those emails – even just to remind them of what’s there”. She would like to increase the SU’s presence in buildings such as the Science building and Engineering building by putting up monthly posters. “Those buildings are quite cold … We could have SU Noticeboards in there saying what’s happening, how to get involved to include those students and make them feel more involved”.